Scampi in a basket – what a treat that was! And still can be if you make it yourself, though you may have to do without the baskets. If you can get uncooked, shelled langoustines for this dish, then you have the real deal. Thick slices of Australian rock lobster are just as good, but to make life easy, I use big, juicy tiger prawns. You can either roll them in flour, dip them in egg and coat in fine, dry white breadcrumbs before deep-frying, or try them this way in a light beer batter. For the batter, begin by seasoning the flour. Make a well in the centre and add the egg and oil. Pour in half the beer and whisk it in. Gradually whisk in the rest to make a thick batter that will coat the prawns. Leave to rest for at least half an hour. To make the tartare sauce, just mix all the ingredients together, then taste and adjust seasoning. Heat the oil to 180°C, or until a cube of bread dropped into it sizzles fairly vigorously. As it heats, keep the extra plain flour in a shallow plate near the hob and place the bowl of batter beside it. 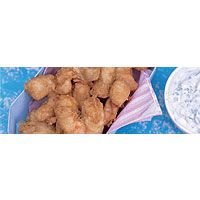 Toss a third of the prawns in flour, then drop them into the batter. Scoop out and fry in the hot oil for 3–4 minutes, until the batter is golden brown and puffed. Drain briefly on kitchen paper then serve with the tartare sauce. A youthful, laser-sharp Muscadet is the perfect foil to the sharp dip and the rich, battered prawns.